CA180283- Formerly a Church: Pews, Electronics, Audio & Video Equip. Furniture, Art, and More. AUCTION CLOSING DATE: Friday, November 23rd beginning at 11:07am PDT. Notice is hereby given that under and pursuant to California Civil Code section 1988(a,b,c),1993.07 and any other applicable CA Statutes, that the items of property listed below are believed to be abandoned by Carlos X. Kelly; Faith Deliverance COGIC Church & All Unknown Occupants after they vacated the premisesat: 4920 70th St, San Diego, CA 92115. Items have been packed and stored offsite. Items will be sold at a Public Auction by: Barbara J Baechler, Trustee of the Baechler Family Trust. 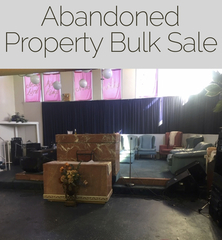 Items to be sold are to include but not limited to: Pews, Electronics, Sound Equipment, Furniture, Speakers, Organ, Chairs, Marble Podium, Table, Ofices Chairs, Wall Art, Microwaves, File Cabinet, Office Furniture, Books, Flowers, Décor, Desks.